Scientists have been working for decades to develop controlled nuclear fusion. Controlled nuclear fusion would improve the ability to evaluate the safety and reliability of the nation’s stockpile of nuclear weapons—in labs in lieu of actual test detonations. And ultimately, it could produce an inexhaustible supply of clean energy. But the challenges have been many. Notably, designing optimal fusion experiments requires accurately modeling all of the complex physical processes that occur during an implosion. One of the biggest handicaps has been the lack of accurate predictive models to show in advance how target specifications and laser pulse shapes might be altered to increase fusion energy yields. Now researchers at the University of Rochester’s Laboratory for Laser Energetics (LLE), along with colleagues from MIT, have been able to triple fusion yields by bringing data science techniques to previously collected data and computer simulations. Rochester’s Laboratory for Laser Energetics is the largest university-based US Department of Energy program in the nation and is home to the OMEGA laser, the most powerful laser system found at any academic institution. The facility has taken the lead in the laser direct-drive approach to fusion energy by blasting spherical deuterium-tritium fuel pellets with 60 laser beams, converging directly on the pellet surface from all directions at once. This causes the pellet to heat and implode, forming a plasma. If sufficiently high temperatures and pressures could be confined at the center of the implosion, a thermonuclear burn wave would propagate radially through the entire fuel mass, producing fusion energy yields many times greater than the energy input. The latest increase in yields, reported in Nature, bring scientists closer to an important milestone in their quest to achieve controlled thermonuclear fusion – getting the plasma to self-ignite, enabling an output of fusion energy that equals the laser energy coming in. “That would be a major achievement but it will require energies much larger than the OMEGA laser such as at the NIF at Lawrence Livermore National Laboratory,” says Michael Campbell, LLE’s director. To create a predictive model, Varchas Gopalaswamy and Dhrumir Patel, PhD students in mechanical engineering, and their supervisor Riccardo Betti, chief scientist and Robert L . McCrory Professor at LLE, applied data science techniques to results from about 100 previous fusion experiments at OMEGA. The statistical analysis guided LLE scientists in altering the target specifications and temporal shape of the laser pulse used in the fusion experiments. The task required a concerted effort by LLE experimental physicists who set up the experiments, and theorists who develop the simulation codes. James Knauer, LLE senior scientist, led the experimental campaign. “These experiments required exquisite control of the laser pulse shape,” Knauer says. Patel applied the statistical technique to design the laser pulse shape leading to the best performing implosion. “This was a very, very unusual pulse shape for us,” Campbell says. And yet, within three or four subsequent experiments, according to Campbell, an experiment was designed that produced 160 trillion fusion reactions, tripling the previous record at OMEGA. “Only thanks to the dedication and expertise of the facility crew, target fabrication, cryogenic layering and system scientists, were we able to control the target quality and the laser pulse to the precision required for these experiments,” Betti says. 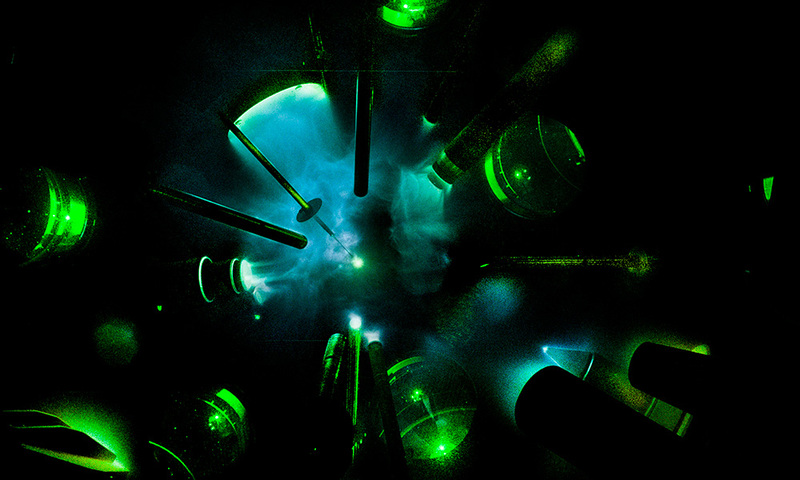 When extrapolated to match the 70-times more powerful laser-energies used at the National Ignition Facility (NIF) at Lawrence Livermore National Laboratory, these implosions would be expected to produce about 1,000 times more fusion reactions. Under the right conditions, a modest improvement in target compression on OMEGA could be enough to approach breakeven conditions at NIF energy levels, with the fusion energy output equaling the laser energy input. “Extrapolating the results from OMEGA to NIF is a tricky business. It is not just a size and energy issue. There are also qualitative differences that need to be assessed” Betti said. For this purpose, a parallel effort by LLE scientists in collaboration with colleagues at Lawrence Livermore and the Naval Research Laboratory (NRL) is underway at the NIF to verify that OMEGA results can be extrapolated to NIF energies. The NIF is configured for an indirect drive approach to fusion experiments, in which the fuel capsule is enclosed within a metal cylindrical can called a hohlraum. Laser beams enter from the can ends and heat the hohlraum, which in turns produces x-rays that cause the fuel to implode. Unlike OMEGA, NIF beams are not positioned symmetrically, but are instead concentrated along the axis of the hohlraum. The indirect drive scheme has also made major progress in recent experiments at the NIF. “They are getting close to achieve burning-plasma conditions,” Campbell says. The paper lists a total of 50 LLE scientists and students as coauthors, along with four collaborators from MIT. The target components were made by General Atomics to meet very strict tolerances.